Super 8 wouldn't be a proper J.J. Abrams film without perplexing viral marketing. This weekend, the clues began filling the internet in earnest, as two newspaper clippings - complete with hidden messages - surfaced on the website ScariestThingIEverSaw.com. ScariestThingIEverSaw.com - a website whose name was gleaned from a camera reel in the Super 8 preview footage - initially had a countdown clock on the screen of an archaic computer terminal. This weekend however offered new material -after finagling your way through a bunch of cryptic prompts, the computer allows you to input several commands. Inputing .PRINT RSCOM8 brings up two articles - a smudge-covered ad for Rocket Poppeteers (which are being shilled by real-life astronaut and alien conspiracy theorist Gordon Cooper) and a page discussing Cold War nuclear treaties. Flipping the Rocket Poppeteers article 180 degrees and superimposing it over the news piece reveals a secret code of highlighted words: "No certainty if a live may be after us We go underground." Between the Gordon Cooper reference, the Area 51 trappings of the preview, and the inordinately complex newspaper code, it looks like they're going whole hog with the conspiracy theory approach. This isn't to say that Super 8 will necessary have a hard espionage theme. Remember, we didn't see the cannon fodder twentysomethings of Cloverfield pounding cans of Slusho! onscreen. 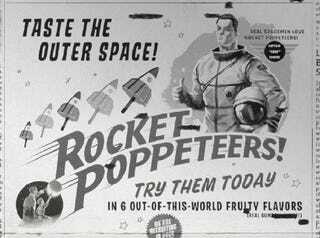 The next clues may lie with the Rocket Poppeteer website, which has yet to go live.